Well, it is safe to say Britain has been bathed in unprecedented sunshine these past few weeks, in fact, I can’t remember what it is like not waking up to blue skies and temperatures in the high 20’s. I love it and the sunshine makes me feel positive and happy, so fingers crossed it continues right into September (please). One thing I’m a firm believer of is in being sun aware & slip slapping on the SPF. I personally use it all year round but it’s so important to use and reapply SPF in these high temperatures especially when spending prolonged periods of time outside. It really is a must to protect your skin and minimise the damage from the harmful UVB & UVA rays. UVA rays are not filtered by clouds or windows and are present all year round. UVA rays penetrate the skin deeply and cause greying of the skin, wrinkles/sagging and cause skin cancer. It is these UVA rays that cause the premature ageing of our skin so finding an SPF with a 5* UVA rating is super important! This purse-friendly range from ASDA are all 5* UVA rated and also provides UVB filters too so that is fantastic. UVA causes the premature ageing of our skin, whilst UVB rays cause sunburn and lead to skin cancer. As the school holidays are underway and many of us are heading off on our Summer Holiday’s be it in Britain or abroad make sure you stock up on SPF before you go. This ASDA Protect range is fantastic for all the family and you can pick it up whilst you’re in the supermarket, which is most convenient. This is your typical SPF for the body, it is quite thick and feels like a body lotion. It is easy to apply and massage in. It gives the skin a white cast when you first apply it but that fades after a few minutes and although your skin feels like you’ve applied SPF it isn’t greasy or heavy and it has quite a matte finish. This is the one my husband prefers to use, I think it’s because it comes in a handy pump bottle which makes it easier to apply. This is a slightly thinner consistency but is just as easy to massage in and it dries down very quickly. Again it doesn’t leave the skin feeling greasy or tacky. You should use a dedicated facial SPF if you can and one that offers a high sun protection. I only ever use SPF30 or above on my face. This is a great sized tube for travel and I often take it with me in my handbag so I can reapply on the go! It has a lightweight matte finish so your face won’t look shiny or greasy and it offers SPF30. All the products in this range contain Vitamin E to help protect against skin cell damage and leave the skin feeling hydrated. After a long day in the sunshine it is important to hydrate & soothe your skin and applying a nice cooling aftersun lotion is the perfect way to do this. My husband prefers to use the gel as it is really refreshing and sinks into the skin faster than a lotion and leaves no greasy residue. After a day in the sun, it’s exactly what your skin needs. It feels so refreshing and cooling, it replenishes the skin, stops it feeling dry and tight and it also helps prevent skin from peeling. It contains Aloe Vera which is great for calming and I like to keep this in the fridge so it is extra cooling. This has the consistency of a body lotion and it helps deepen and prolong your tan. I love applying this to my arms & legs just so my golden tan stays looking fab for longer. This is so easy to apply and although it isn’t as soothing as the gel I really like that it helps enhance my tan, as I am not someone that likes to be out in the sun too long so anything that helps me get a bit more colour without having to actually be in the sun gets a thumbs up from me. It has a nice fresh scent and the cream is quite lightweight and easy to apply. 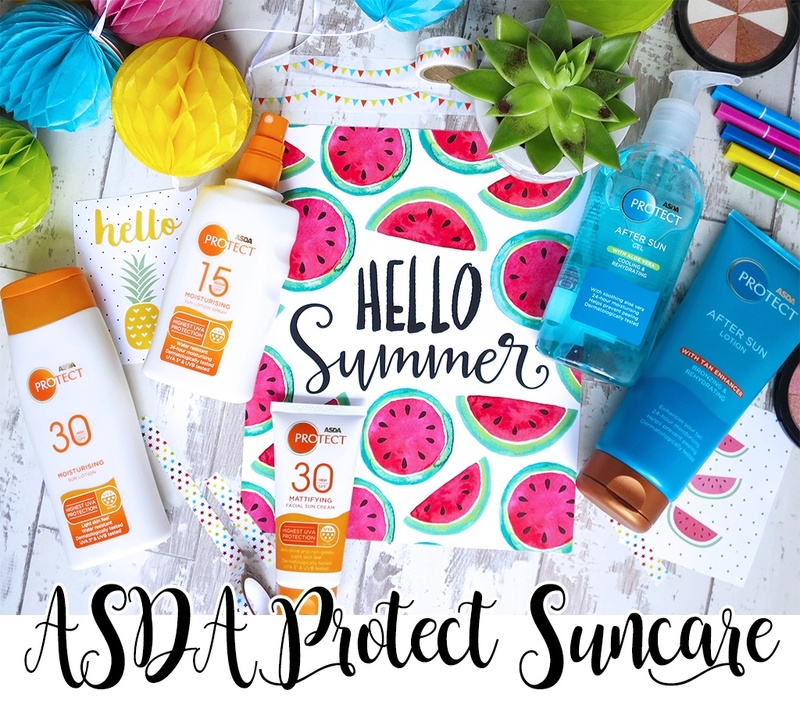 If you’re heading away on holiday or have some fun day’s out planned in the UK make sure you check out the ASDA Protect Sun Care Range next time you’re in a store. It is affordable and offers 5* UVA protection, so your skin is in good hands!